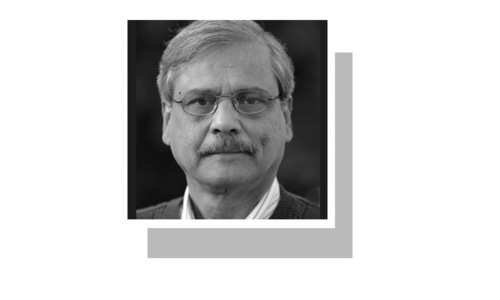 Indeed, Sharif’s re-crowning will help maintain a façade of unity within the party ranks and prevent the possibility of the leadership passing to the other branch of his family’s political dynasty. But can this also win him moral legitimacy? Just holding on to the party leadership will not clear him of the charges he is facing in a court of law. The way the government railroaded the bill through parliament does not augur well for democracy. Apparently, the reason behind this hasty passage of the amendment was to bring the courts under pressure. But the move may not work. Instead, it may trigger yet another round of legal battle as the amendment has already been challenged in the courts. Undoubtedly, the military-led government of Pervez Musharraf used the law for its own ulterior motive of preventing Benazir Bhutto from leading the PPP. But, in this case, the objective of striking it down was certainly not to correct an unfair move; it was to benefit a disqualified leader. It also exposes the absence of a democratic culture within our political parties that have increasingly become family fiefdoms and a tool for the protection of the interests of a few. Democracy draws its strength from the rule of law and not from defying it. Democracy can work effectively only if political parties are able to censure their leaders for their wrongdoings and not wait for the court to decide their fate. But it is completely opposite in the case of Pakistan where those facing corruption charges continue to hold high office and are eulogised by their supporters. For instance, how can a man indicted for money laundering remain in charge of the country’s economy and finances? One can argue that Ishaq Dar has still not been convicted; one can even question the fairness of the trial. But would it not be better for him to step aside until he is cleared of the charges? For sure, a tainted finance minister cannot fulfil his responsibilities effectively in running an economy that seems to be in free fall. Foreign exchange reserves are depleting at an alarming rate with falling remittances and declining exports. The record balance-of-payment deficit has made it almost inevitable that the government will return to the IMF. The debt burden is becoming untenable. It will be a serious problem for a finance minister under trial to negotiate with multilateral agencies. For months now, the finance ministry has been in a state of paralysis. It is, indeed, a serious issue that the interior minister did not know who called the Rangers. The situation turned weirder still when Ahsan Iqbal was stopped from entering the court premises. Surely the Rangers did not come there without orders from somewhere. His public outburst and remarks about a state within a state demonstrated his helplessness. It is certainly not a good omen for the government. The incident reinforces the perception about the government’s shrinking governing space while it is focused more on defending the ousted prime minister and his family. It is not enough to shout from the rooftop about the ‘invisible hand’. It is the governance, stupid. We have already seen the establishment gaining greater space. 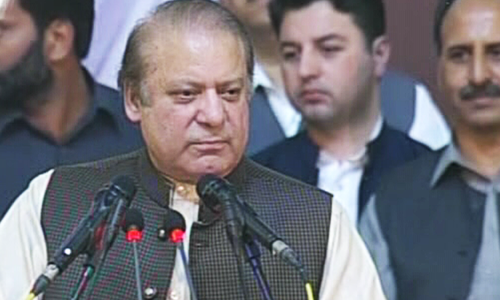 Nawaz Sharif has called for a grand national dialogue among political parties. One cannot disagree with the proposal. There is, indeed, a serious need for the main political parties to come to an agreement on some kind of framework to strengthen the democratic process. But Sharif’s call may have come too late and at a time when he has been disqualified for not being honest and is facing trial. That makes the other political parties suspicious of his intent. There is scepticism that it is all about him being bailed out of his plight. More importantly, there is a need for an economic charter among political parties to guarantee the continuity of economic policies irrespective of whichever party is in power. Perhaps, this will become possible after the elections. Everybody knows who is destabilizing the democratic process. An excellent analysis, but unfortunately who amongst the people who matter will even read it, leave alone ,taking some heed from it. Such a pity. The terms used: controversial - for those that disagree with the amendment otherwise the amendment was passed unanimously. Bulldozed, railroaded? Unanimous support means the matter is understood by all and there is no need to delay. Sad to say there is overwhelming support from the public for the tainted ex-PM and indeed that is what the public deserves too. We have a culture of attaching importance, devotion and allegiance with Masters from the days of the Mughal Empire dynasty and the British Raj. As citizens we would rather live in poverty ourselves but love to see our Masters exploiting us and making monstrous amounts of money. Extremely good piece of article by Zahid Hussain. The helm of affairs of PML(N) Govt are in doldrums. Putting the subject of corruptions, bad governance,under the carpet,will not be suffice, nothing substantial delivered for economic uplift of common man. 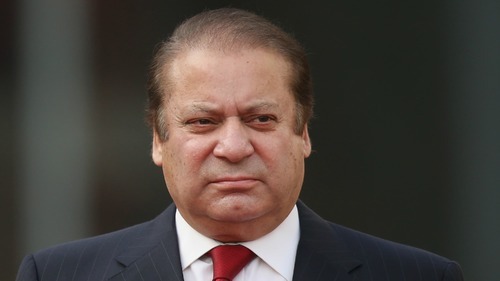 A deposed but frustrated former PM is going through a face saving era, but ahead he and his family have to face the difficult inquiries at NAB and SC,no matter whom they choose as new Chairman NAB. Media is the fourth pillar of democracy. There is no democracy without adherence to moral principles .The amendments in the election laws has serious political consequences for PMLN. It may well turn out to be its undoing. I really do not understand why we bemoan the Jagirdari culture in politics. We are a feudal society and this reality cannot be ignored. Unlike the West, democracy came to third world nations before their industrial revolutions. In India too, politics remains a family business across regions and party lines. This is how it is going to be for at least a couple of generations. Why only politician has to play by rules? What about establishment who do not even listen to interior minister in whose under they come? It is quite juvenile to even give an impression or discuss that the internal election of PMLN has any effect in clearing NS of his charges. With all due Respect, Pakistan is hijacked by Mob of so called politicians who are leeches of economic crisis in the country. No one can erode, what you never had in first place. @khaled glad that we still have people who can think straight. @Tahir A did you say" overwhelming"? I pity you. What has moral legitimacy got to do with immoral elections and immoral society?? People of Lahore and surrounding area have subservient mentality which is reflected in their submissive welcome to British and Sikhs Mughals and now from Jatiumra. Pathetic. The wheel of law is slow but it can crush you into dust. wait and see the logical end of investigation. Party presidency can't save him. Who cares for morality !! Nawaz Sharif is fighting back against humiliation. any Negative Bill can be passed in our parliamentary system . . . . .
sincere piece of advice. Hope people in the corridor of power pay heed. This is akin to suggesting that The Corleone Family became respectable and legitimate after donation some (ill-gotten) money to the Church. Miyan Sahab is a born leader and will always remain most popular leader of Pakistan. People and politicians are trying to malign his reputation. Pakistan needs Miyan Sahab as PM for next 20 years. Prime Minister must pay attention economic situation as mention the writer and depute honest , Capable and experience finance minister in the interest of Pakistan. Amendment was passed in NA and Senate according to constitution, How come its mockery? When military dictators enforce emergency and change laws with ordinances than its all good. I hope our intellectuals will at least start being Fair. It is amusing how the Exalted Columnists berate Pak politicians. They go into hibernation when misdemeanours of the uniformed boys need to be condemned. Tthe deafening silence of these very columnists during the mysterious disappearance of bloggers was very telling. May God give them wisdom. Very good article. When politicians talk about hidden hands and don't have guts to call spade a spade they then lose moral authority to rule. If they are unable to control their subordinates they then don't deserve to rule. Healthy, honest and impartial criticism of PML-N. There is no need of another conference to prop up democracy because democrats did not learn lesson from the last Charter of Democracy signed in London. Democracy will not take root so long people are illiterate, ignorant and busy in their survival war. They are easily fooled or bought by catchy slogans and money at the time of election. What worries most is the collapse of governance in most part of country, state of environment where even clean water is not available. Country is at the edge of financial collapse. There is immediate need to call meeting of all the political parties top leaders , senior bureaucrats, senior university professors and judges to find out basic ailment that are hindrance in real democracy, poverty elimination,employment, poor industrial development and quality and quantity education.Lay down a charter to tackle these problems and make them part of constitution. If a business fails we blame the leader. In a democracy the people are the leaders. Pakistan is an egregious example of how people fail to vote wisely, constantly getting sidetracked by emotions about religion, India and the few personalities that keep rotating in and out. Most South Asian countries have this problem - Pakistan to a very large extent. "The cabinet seldom met and was virtually turned into a rubber stamp." _ Did anyone notice? " Those facing corruption charges continue to hold high office and are eulogised by their supporters." _ Because of a system of political patronage. @khanm ... ... Since we cannot change the leaders why don't we change the people... Some kind of revolution is inevitable.